This charming holiday home adjoins another holiday property. With air conditioning and large French windows letting in plenty of light, this gives the interior a bright and comfortable atmosphere. 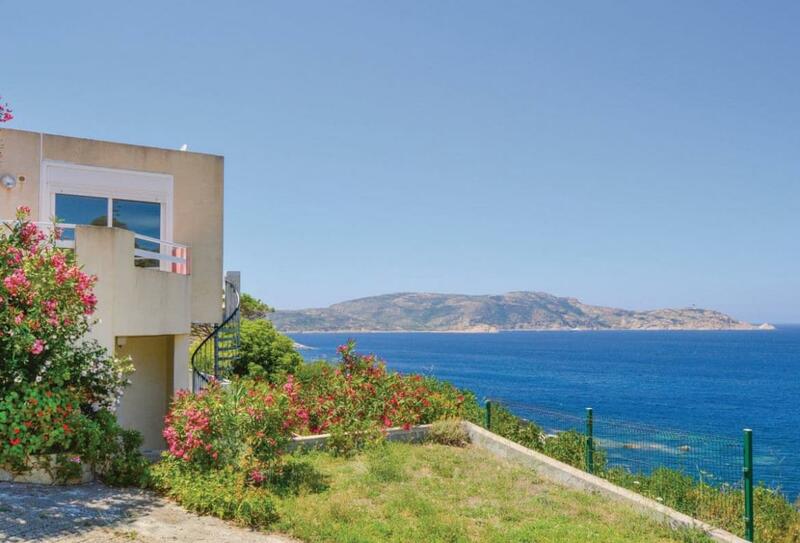 Lose yourself in the incredible view of the Mediterranean and the Revellata lighthouse. Night after night, as the sun sets over the sea, you can witness a spectacle which cannot cease to impress. Go bathing below the villa, on the rocky coast or enjoy the calm and explore the natural surrounding on horseback, on foot or perhaps by bicycle. There are fishing opportunties 100m away. Shop 500m and restaurant 100m. Lounge/diner, kitchen, 2 shower rooms with basin (no toilet), 2 separate toilets, 3 bedrooms: 1 double, 1 twin, 1 bunk plus bunk bed. Heating, cot, colour TV (French channels only), washing machine, dishwasher, microwave, terrace, balcony, outdoor furniture, barbecue, off road parking for 2 cars. Sorry, no pets. NB: Steep, spiral, open tread external staircase.